​from Captain Cook's voyages to the end of the nineteenth century. This international conference will explore the entanglements of English literature (including travel writing, novels, journalism, and poetry) with Pacific geographies and cultures in the late eighteenth and nineteenth centuries. The concept of the “transatlantic” has become familiar in Anglo-American literary studies, but it is only in recent years that the counterbalancing notion of the “transpacific” has received sustained scholarly attention, driven in part by the growing global economic importance of the Asia-Pacific region. Our conference examines the period—broadly beginning with the end of the Seven Years’ War (1763), the voyages of Captain Cook (1768–79), and the founding of San Francisco (1776), Los Angeles (1781), and New South Wales (1788)—in which Anglo-American attention first begins to “pivot” towards the Pacific, extending through to the imperial engagements of the mid nineteenth century which open a series of ports (including Shanghai, Hong Kong, and Yokohama) to Western trade. These developments give rise not just to a flood of travel writing and journalism on the Pacific but also to numerous literary works by authors (including Melville, Twain, Kipling, and Ballantyne) fascinated by the vast expanse of the Pacific and by its diverse Asian, Oceanic, and North American cultures. The conference will focus, in particular, upon the “gateways” to the Pacific offered to English travellers and traders by the ports along its rim. These include the major centres of local commerce (Osaka, Hangzhou, Shanghai); long-established European colonies (Batavia, Macau); ports opened by imperial coercion in the nineteenth century (Hong Kong, Yokohama); and newer communities created by expanding colonial empires (San Francisco, Wellington, Vladivostok, Vancouver). These ports become hubs for the exchange not just of people and tradeable goods but also intellectual and imaginative developments. They act as national and imperial nerve-centres, kernels of settlement, sites of intercultural interaction, and even hot-beds of anti-imperial resistance. By bringing cultures together in highly local and specific ways, often in different relations of power, these sites generate hybrid languages and literary forms which, because of their position on the hubs of global circulation, become swiftly exported and adapted. In addition, they become important objects of artistic and literary representation in their own right, often tending to dominate the European history of representation of Asia. 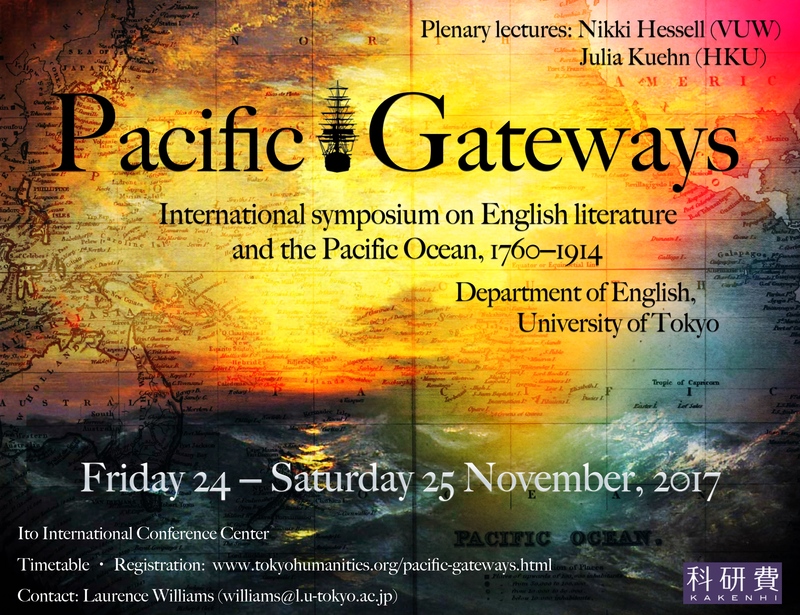 We will ask how these Pacific gateways shape the development of a “transpacific consciousness” in Anglophone literature, whose modes of exchange and patterns of thought can still be seen in modern-day attitudes to the region. Drawing on our location in Tokyo, we will explore the triangulations between Japan, the West, and other Pacific cultures created by the “opening” of the country to trade in the 1850s and the resulting transmission of travel accounts and "japonaiserie" back to Europe. We also welcome papers which focus on other cultures and regions or explore broader transpacific flows. We will aim to replace older models of “East” meeting “West” with a more polyglot and cross-cultural history of Anglophone literature in the Pacific, in which the networks and communities established by Anglo-American imperialism coexist with established intra-Asian networks. ​— The persistence of 19th-century networks in the present day, in the context of actor-network or globalisation theory. The symposium will include around 16 papers over two days (without parallel sessions, so that everyone can hear each other's work). We plan to publish an edited collection of essays based on the event.